Zakharova touchingly expressive, Bolle faultless, in a Manon at La Scala which had almost perfect casting. While the role of Manon doesn’t represent the pinnacle of acting challenges, it is surely one of the most satisfying. For a dancer who can act it is a gift, with each scene offering a new state to convey: from the young girl playing at flirting, to becoming the joyfully passionate lover (in the first bedroom pas de deux), to the calculating social climber, to the knowingly assertive lover (second bedroom pdd) to the spent and humiliated figure of the final act. It’s a wonderful curve to follow for the dancer and the audience. 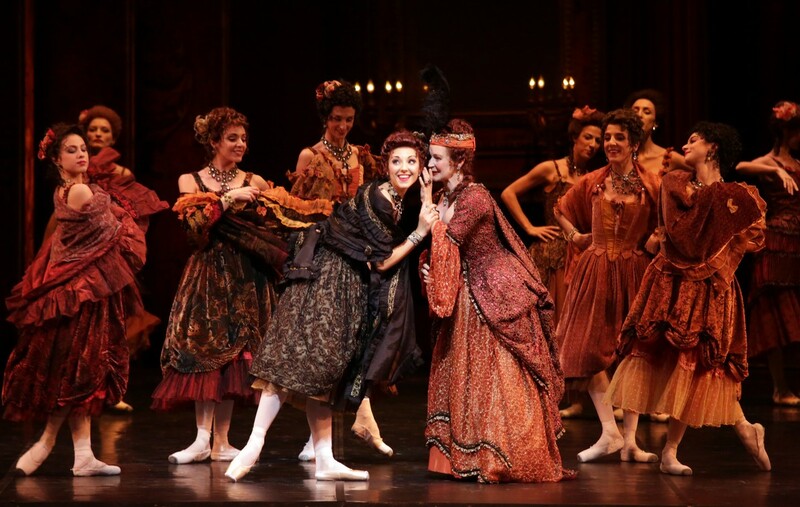 Svetlana Zakharova is surprisingly fine portraying all the aspects of Manon’s character. Surprisingly, because several years ago I found her to be committed but aloof. Performances in recent years have revealed a warm and loveable side to the Bolshoi’s queen. Playing with her (exquisite) foot she notices the effect it has on the men around her in the first act and she studies the over the shoulder flirtatious look. By the party scene she has learnt her craft, seduces the room, and is glorious to watch as she dives into the group of adoring men eager to fleetingly brush against her. Zakharova doesn’t have the physical abandon which gives the visceral thrills of the final act — Natalia Osipova at La Scala in 2013 was tragic portraying both Manon’s mental and physical decay — but nevertheless was touchingly expressive. Roberto Bolle was her ever-reliable partner — always attentive, always involved. He showed beautiful control, especially during his faultless opening-scene variation, and the delightful smiles between him and Zakharova during their first bedroom pas de deux revealed the complicity of a stage couple who have by now danced hundreds of times together. It is a role that fits him well and he seems to be freer within it than with other period characters where he can seem restricted by their formal bearing. A feline Martina Arduino as Lescaut’s mistress was technically marvellous and put on a convincingly brave smile trying to cover for Lescaut’s drunkenness during their pas de deux. This scene never works at La Scala as it does with The Royal Ballet — it must be a cultural thing — and Nicola Del Freo, who elsewhere was first-rate as Lescaut, missed the slapstick timing here with his beautifully executed dancing being too together with the music, without the slightly anticipated or late steps that give the comic bite. Character casting throughout was spot on. Alessandro Grillo as Monsieur GM was slimily menacing, a Harvey Weinstein as captured by Hogarth; Mick Zeni was a smoothly intimidating Gaoler; and Deborah Gismondi’s Madame was maybe the best I have ever seen, with a Judi Dench-like mischievousness in her smile, and a inner earthy vulgarity that emerged more and more as the evening wore on, which works so much better than when she’s portrayed like a dowager hosting a country house party. A special word for the trio of young gentlemen who could hardly be bettered, bringing together three of La Scala’s best male whiz kids: Marco Agostino, Christian Fagetti, and Mattia Semperboni. Russian conductor Felix Korobov, who appeared last year at La Scala conducting Onegin, produced some ravishing sounds from the pit and pleasingly it seems as though this is the start of a new collaboration as he will return for other ballets in the coming season.